The Zucker Rocket was not an operational rocket at all, but a series of flashy-looking hulls powered by powder rockets like those used in fireworks. 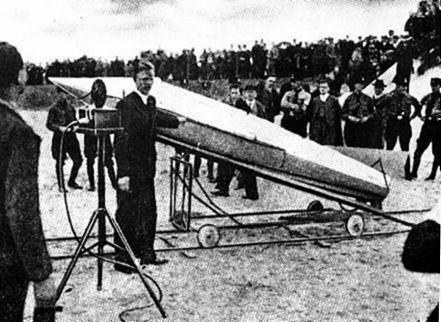 Zucker travelled through Germany in 1931-1933, displaying his rocket, selling tickets to launches, and then selling fraudulent postal covers carried aboard the 'flights'. The highest recorded altitude achieved in Germany was 15 m.
Status: Retired 1933. First Launch: 1933-04-01. Last Launch: 1933-04-01. Number: 1 . He moved on to Britain, where a smaller version was said to achieved an altitude of a 'half mile' in 1934. Zucker was deported from England for postal fraud, only to be detained by the government on return to Germany. Commitment to an asylum was avoided, but he pledged not to conduct further experiments. He emerged again in 1964, when the death of a boy during one of his experiments in Braunlage led to a general ban against rocket flights in West Germany. By the 1970's he was again selling fraudulent rocket post covers. He died in 1985. 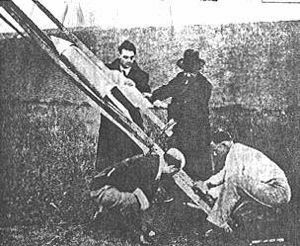 Gerhard Zucker first came to public notice in 1931 when he began flying fireworks-type powder rockets on 'rocket post' flights in various villages in the region. In 1933 Zucker began touring Germany with his amazing 'operational rocket'. The recoverable cruise missile was 5 m long, had a thrust of 360 kg and a takeoff mass of 200 kg. Later versions were supposedly capable of cruising out 400 km from its launch point at an altitude of 1000 m and a speed of 1000 m/s. 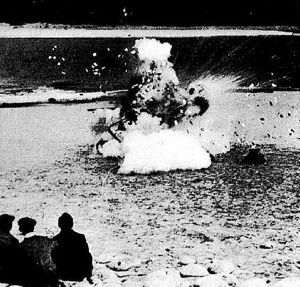 It could then return after having delivered a bomb payload or having taken reconnaissance photographs. In actuality the missile was only an enormous hull equipped with eight powder rockets. Zucker showed up in Cuxhaven on the German North Sea coast in the winter of 1933, ready for a long-range demonstration (15 km, from the coast to Neuhaven Island). After being stuck in a ditch while being taken out to the field for a February launch attempt, the great day finally came in April 1933. A huge crowd of local folk and officials gathered to witness the event. After staggering 15 m into the air, the torpedo came crashing down. This did not prevent Zucker from touring other towns in Germany, attempting further rocket tests, and selling non-official 'rocket' postal covers supposedly carried by his rockets. In the winter of 1933/1934 he was said to have demonstrated his rocket to Nazi government officials. They later claimed that they wanted him to develop the rocket to carry bombs, which he claimed that he refused to do. He next appeared in England, where in May, 1934 he exhibited his rocket 'postal covers' at the London Air Post Exhibition. There he claimed that he wanted to interest the British government in his rocket. Photographer Robert Hartman agreed to be his publicist, and postage stamp dealer C H Dombrowski backed production of Zucker rockets in Britain. The group planned to make thousands of pounds on the sale of Zucker's 'rocket post'. Family: test vehicle. Country: Germany. Launch Sites: Cuxhaven. Bibliography: 2, 47, 556, 557, 559, 560.